Why is logistics important for my company's success in Europe? To become successful in the European market, offering the right product for the right price is just not enough anymore. If your company plans to compete with the existing players in the market, you must do it at the right place, at the right time, and in the right configuration. So, it is essential to set up an effective and efficient supply chain, tailored to the unique characteristics of your products, service levels and markets. There are many ways to set up your European supply chain. One of the most common is the centralized European distribution model, in which stock for the whole European market is stored in one centrally-located warehouse, and the supply chain is managed from this central point. Where should I set up my European Distribution Center? One of the crucial aspects in designing your European supply chain is selecting the right location for your European Distribution Center. Location factors such as air and sea port capacity, quality of the transport infrastructure, availability of logistics services, employment and real estate are obviously important. But don’t forget to consider customs regulations and the tax environment as well. The Netherlands is an ideal location from which to serve the European market. 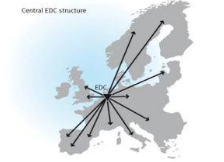 In fact, more than 50% of all international companies using a Centralized European Distribution Center locate their center in the Netherlands. What is the difference between an EDC, an RDC and a BCD? Some of the most popular supply chain configurations we find in Europe include those with an EDC (European Distribution Center), multiple RDCs (Regional Distribution Center) and a BDC (Bulk distribution Center) in a network of local satellite warehouses. In a configuration with a (centralized) EDC, products are shipped directly from production to the EDC (usually in full containers), and from there shipped out to customers all over Europe after the sales order comes in. The advantage of this set-up is that it is cost-efficient, as a result of consolidation of inbound transport, and the fact that only one warehouse is needed. Besides, it is a relatively simple set-up, and therefore easy to manage and popular among companies that are entering the EU market. As new countries have joined the EU over the past few years, the EU market has grown geographically. In addition, the required delivery lead-times have become shorter and transport costs are rising. As a result, for some of the larger companies it has become inefficient to supply the entire European market from one central DC. In a regionalized set-up, a company will have multiple distribution centers (RDCs) (typically 3 or 4) spread out over the European market, each supplied directly from production overseas, and each serving a particular regional part of the market. Often supply chains using this configuration are still managed from a central control center. In a configuration with a bulk distribution center (BDC) in a network of local or national satellite warehouses, the BDC is supplied directly from production and is a relatively simple operation (pallets in and pallets out). Its main function is to supply local satellite warehouses via regular replenishment. Distribution to the market is done from the satellite warehouse, and also customization may take place here. The advantage of this set-up is that a company can keep the costs for inbound transport low, as a result of consolidation of inbound transport, but at the same time offer quick delivery times to the market, as the inventory is located close to the (main) customers. The optimal supply chain will be different for every company, depending on factors such as product type, customer’s location, required order delivery times, etc. Which Supply Chain setup is most suitable for my company? There are many ways to supply products to the European market. NDL/HIDC’s logistics experts can advise your company on this topic. When I start doing business in Europe, should I set up my now distribution center, or can I find a partner who can do this for me? The choice between outsourcing and setting up your own logistics operation depends on various issues: Is logistics a core or strategic activity? What would be the type and scale of the operation? What is the required time-to-market, and how much logistics knowledge is available in the company? In Europe, outsourcing logistics activities to logistics service providers (LSP’s) is more common than in other parts of the world. Of all operations, about 65% is outsourced worldwide, but in the Netherlands this percentage is an even higher 75%. An explanation for this high rate of outsourcing is the fact that many international logistics services providers use the Netherlands as their major hub for Europe so there is a large variety of LSP’s in the Netherlands; also the quality of logistics services in the Netherlands is very high. So for every company it is possible to find a suitable logistics partner that exactly meets your requirements. Which services can I outsource to a logistics service provider? Logistics services providers (LSPs) in the Netherlands offer a wide variety of services to their customers. With their extensive knowledge of the local (transport and logistics) market, the LSP can also assist you in optimizing your supply chain, which can save costs and improve lead-times. What are VAL AND VAS services? The primary activities that take place in a distribution center include receiving goods, storing goods, and preparing goods for shipment. Nowadays, in addition to these traditional logistics activities, many high-value activities are performed in most distribution centers in the Netherlands. These additional activities can be divided into Value Added Logistics (VAL) and Value Added Services (VAL). How can I identify a suitable logistics service provider (LSP)? If you decide to outsource your European logistics operation, the next challenge is to find the LSP that best meets your needs. While there are plenty of logistics services providers, all with their own fields of expertise, it can be quite difficult to determine exactly the one that will suit you best. Due to our in-depth knowledge of the local market, NDL/HIDC can help you identify the partners that best meet your specific logistics requirements. Can HIDC help me find commercial distributors? No, NDL/ HIDC assists international companies to set up their European supply chain activities in or via the Netherlands by supplying information, advice and matchmaking services. Unfortunately, however, we do not have enough knowledge of all market segments to also supply these companies with lists of potential buyers or distributors. Are there tax and customs advantages importing my goods via The Netherlands? Since foreign trade and investments contribute significantly to the Dutch economy, the Dutch government works hard to create an attractive business climate for foreign companies. Theoretically, customs duties are payable when goods are imported into the European Union (EU). But the Netherlands allows the payment of these duties to be postponed through the storage of the goods in a customs bonded warehouse. Only when the goods are shipped out of the warehouse does the company pay the import duties. This can result in considerable cash-flow advantages. In contrast to most other EU member states, the Netherlands has instituted a system that provides for the deferment of VAT at the time of import. Instead of paying VAT when the goods are imported into free circulation within the EU, the payment can be eferred to a periodic VAT return. Under this system, the VAT at import should be declared but the amount can be deducted on the same return. The bottom line is that there is no actual payment of VAT at import, so that you can realize cash flow and interest-earning benefits. Dutch Customs makes use of computerized clearance systems that speed up the flow of cargo. Also, as a result of uniform and standardized documentation across the EU, approval time is minimized and costly delays are eliminated. What is the VAT deferment system? Value Added Tax, or VAT, is used in all European Union states and in many other nations around the world. VAT, as its name suggests, is a tax on the value added by each producer in the economy. The payment of VAT can be moved from the time of import to when the company declares taxes, usually monthly. The VAT due for the import will be recorded in the declaration as payable, while at the same time, amounts will be subtracted as pre-paid taxes. To obtain this deferment, the importer must apply for a license at the tax department under “Article 23.” The amount of import declared each month must also remain constant, and bookkeeping must meet specific requirements. Do we need to set up a company to use the VAT deferment system? No, a company without an establishment in the Netherlands can appoint a fiscal representative. A fiscal representative works for a foreign company and deals with all its VAT obligations (VAT declarations, listing and paying VAT). There are two types of fiscal representatives; limited and general. A limited fiscal representative acts on behalf of a foreign company to import the goods and make the subsequent deliveries. This means importing from outside the EU to a customer in the Netherlands or another Member State. The general fiscal representative acts on behalf of a foreign company for all deliveries for which tax must be paid, the intra communal acquisition and import. For both types of fiscal representative, a license is needed as well as a customer’s statement officially appointing the fiscal representative. Many logistics services providers offer fiscal representation as a service to their customers. What are import duties and how do we know how much we need to pay? Import duty is a form of taxation to be paid by the importer of goods from outside the EU. The amount to be paid is usually calculated as a percentage of the customs value. The customs value consists of the invoice value, plus the costs for shipping the products to the EU border. The percentage depends on the type of product that is imported. All goods are listed in the “Combined Nomenclature” (CN), which is the EU’s coding system for classifying products. The Integrated Tariff of the European Communities (TARIC) lists the duty percentages per product, as well as information on tariff quotas and other trade measures. Import duties are the same in every EU country, so there is no difference between importing a product into the EU via the Netherlands or via e.g. Spain. What are the advantages of having a bonded warehouse? Instead of customs clearing the goods upon arrival in the EU, a company can also store them in a warehouse under customs control; a bonded warehouse. Goods can stay in a bonded warehouse for an unlimited period of time, and no import duties and VAT will have to be paid until the moment they are actually imported into free circulation in the EU, e.g. to be transported to a customer. As the customs control of a bonded warehouse is mostly administrative, there is usually no physical separation in the warehouse between goods in free circulation and goods in bond. If the final customer is located outside the EU, the goods can be transported under customs bond (T1) from the bonded warehouse to the country where the buyer is located. In this way, customs duties and VAT at import are only paid in the country of destination, and double payment is avoided. What is binding tariff information (BTI)? Binding Tariff Information (BTI) is an EU-wide system designed to allow economic operators and traders to understand the proper classification of goods in the tariff and correct statistical nomenclature. The BTI, which is generally in effect for six-year periods, provides legal guarantees to traders, ensures uniform application of appropriate nomenclature, allows duty rates to be established at import, and facilitates the use of import/export or advance fixing-certificates, calculation of export refunds, etc. What is AEO, and do we need to apply for it? Authorized Economic Operator (AEO) is a status that can be granted by customs authorities to reliable traders that are established in the European Community. The principle of the AEO, which is very similar to that of the C-TPAT in the USA, focuses on the evaluation of the guarantees and procedures in place that ensure safety and security throughout the entire supply chain, instead of focusing on checking individual shipments. Every company that is involved in the transport of goods to and from the EU, i.e. manufacturers, importers, exporters, brokers, carriers, ports, airports, terminal operators, warehouses, distributors, can apply for AEO-status. A company will be certified as an Authorized Economic Operator when it can prove that it complies with certain conditions related to security in the supply chain. The AEO certificate is valid in all EU Member States, so a company will only have to apply for it once. Although obtaining AEO status is not compulsory, it is advisable for companies involved in EU trade to apply for the certification. Companies that have AEO-status will benefit from trade facilitation measures, such as fewer physical customs inspections at EU borders, priority treatment when selected for inspection, simplified administrative compliance procedures, all resulting in lower costs, higher efficiency and shorter time-to-market. Companies might also need to apply for AEO status in order to remain competitive and to comply with the demands of their (potential) customers. There is an EU-wide AEO database containing the names of all companies that have AEO status, and potential trade partners may only want to do business with certified companies, as it acknowledges their trustworthiness and reliability. How can we apply for AEO status? To apply for AEO status a company will have to send an application to the customs authorities of one of the EU Member States. To be granted AEO status, the company should comply with certain criteria related to security in the supply chain. It should for example have a satisfactory system for managing commercial and transport records, which allows for appropriate customs control, and it should have proven financial solvency, and appropriate security and safety standards. The application is largely based on self-assessment and consists of three parts; the AEO application form, a summary of the self-assessment, and a declaration that the applicant is aware of the relevant legislation, and will maintain its compliance. Within 10 days after the application, the authorities will inform the other Member States of the application, and within 300 days it will decide whether AEO status will be granted.